O always tells people if they want to lose weight just follow around Grandmaster Chan for one day. That is definitely one way to burn calories. 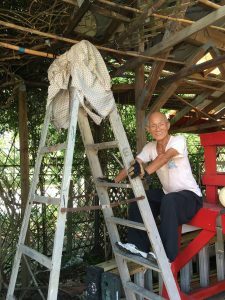 A day in the life of Grandmaster Chan consists of waking up before the sun and working in the sun, often until it goes down. Grandmaster Chan enjoys his time in the garden and tending to his fish. 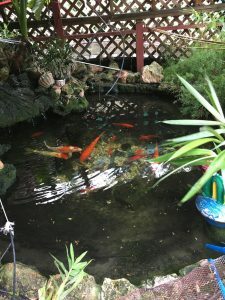 Whenever he goes on vacation, one lucky person is given the task of watching over his fish and plants. No one wants this job. All will be going well, and then right before he is due home, suddenly a plant or worse, fish dies! It is a nerve racking time for us back home and we have been known to try and resuscitate fish! No CPR or anything, but we were taught to push the fish through the water, as it moves the water through the gills. We have saved a few this way. Back to a day in the life of Grandmaster Chan. He is a creature of habit. He wakes up goes to the Temple to bisan, and makes his breakfast. (usually oatmeal and coffee) While water is boiling or the oatmeal is cooking he will start clearing things around the kitchen. After his breakfast he starts his outdoor routine. 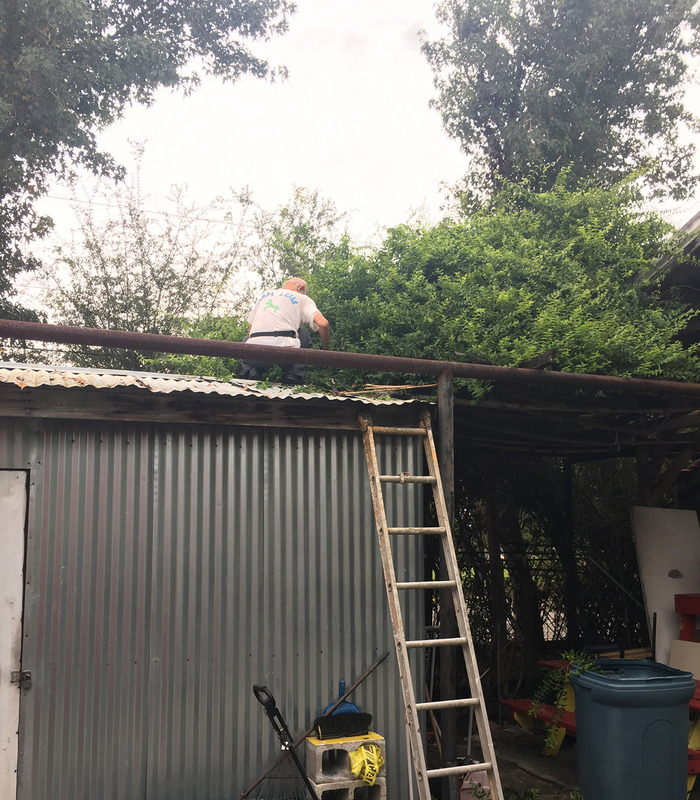 If you have ever been around the Temple in the morning or mid day, you might catch him doing any of the following: building fences of bamboo, clearing leaves or garbage from the Temple grounds, planting new trees, or even on the roof clearing the gutters. I am not very happy about that one! Depending on what area needs his attention he makes his way there and never asks for help. As a matter of fact when you try to help it often ends up being a bit of a fight…and who wants to fight with a Grandmaster of kung fu? At that point just volunteer to take care of the fish. A question I get asked a lot is: Does he still practice kung fu? And my answer: every day. Maybe I haven’t ‘seen’ him doing right hand stick or 36 hands this week, but I see him using a broom (stick) to sweep the floors everyday, and I watch in awe as he moves up and down in a squat or to a side to side while cooking, cleaning, chopping, or clearing the grass…just like a form. He is constantly moving, and constantly working…. working hard = kung fu. Get a FREE REPORT on the benefits of Wah Lum!